Heyrocco! Great name for a band and an even better single to begin their 2013 campaign. 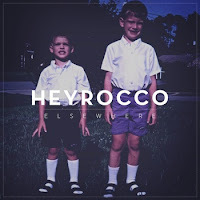 "Elsewhere" is an explosion of echoing guitars, tight powerful rhythms and floating high pitched vocals creating an intimate yet chaotic sound of Heyrocco. The trio, based in South Carolina have formed a bond of music, style and creativity and have been spreading their ideas with the world ever since. They're actually good friends with Brave Baby who we featured recently.